This may sound strange but it’s true. Of the 73 government-run anganwadis, 38 function from private premises such as houses and shops on rental basis. Making matters worse is the fact that around nine anganwadis functioning from private premises lack toilet facility due to which students, teachers and helpers are forced to go out into open or at times in nearby houses to answer nature’s call. It is learnt that around 29 anganwadis are running in Government Primary School (GPS) buildings, seven anganwadis are running government built structures under RDA including at Nandanvan run by Vedanta Group. 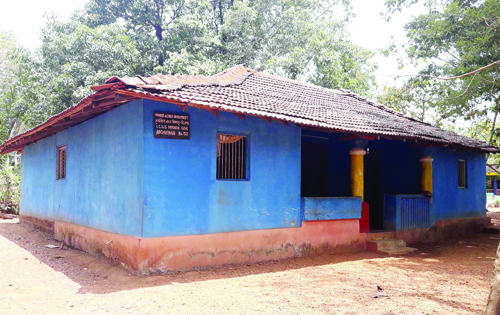 Sources in the Child Development Office Pernem block stated that the main reason for non-development of anganwadis is space problem. Since these 38 anganwadis are running in rented premises, the land is private and the government has no option than to function in theses limited spaces which lack toilets, playing area and kitchens. Sources further informed that in some anganwadis, the owners allow the children and teachers to use their private toilets. The other problem is the rent. The rent paid by the government is Rs 200 in rural and Rs 750 in urban areas. But the amount collected by the owners is double. Some charge Rs 500 and more. But since the government pays Rs 200 the remaining amount is paid by the teachers. In some villages, the panchayat contributes Rs 200 towards payment of the rent of these anganwadis but still some charge more. Sources further stated that at least one anganwadi functions from a GPS building in each village panchayat. Each Panchayat has 2-3 anganwadis which normally cater to the needs of the local and migrant children. The rent amount which the government releases towards the payment of rent is not regular. Sometimes the owners receive the same after 3 months or at times after 6 months and this has put a heavy burden on the teachers as they have to shell out money from their pockets in paying the rent amount. The situation is same with provision of gas cylinders. When Herald spoke to a few anganwadi teachers, this is what they had to say. Another teacher said, “Our anganwadi functions from a house which is taken on rent. It has a bathroom but no proper toilet. To make matters worse, there is no water supply and we are forced to fetch water from the neighbouring houses. Another problem is the rent. The owner charges Rs 800 as rent but government only pays only Rs 200 as rent while the panchayat provides another Rs 200. We have to pay the remaining amount from our pockets. Since the owner does not reside here, we are forced to even pay the electricity bills”. The project officer of Pernem Block said, “We have been trying our level best to shift the anganwadis from the private property to government buildings where they could get all the facilities such as kitchen, hall and toilets”. The anganwadis in Pernem which function from government premises are at Ibrampur, Hasapur, Chandel, Ozari Sangewada, Parabwada Torxem, and Sakral & Nandanwan. Some anganwadis in Pernem have strength of only 3 to 9 children and are on the verge of closure. They are Naibagh, Gauthanwada Ozari, Sangewada Ozari, Bhutwadi Virnoda, Chichule Dhargal, Deulwada Ugave and Khajne. The anganwadi at Mopa has the maximum number of is 25- 30 children.